Big Walnut’s Abby Facemyer battles for a rebound with Olentangy’s Cassie Dulay, left, during the first half of Tuesday’s non-league showdown in Sunbury. 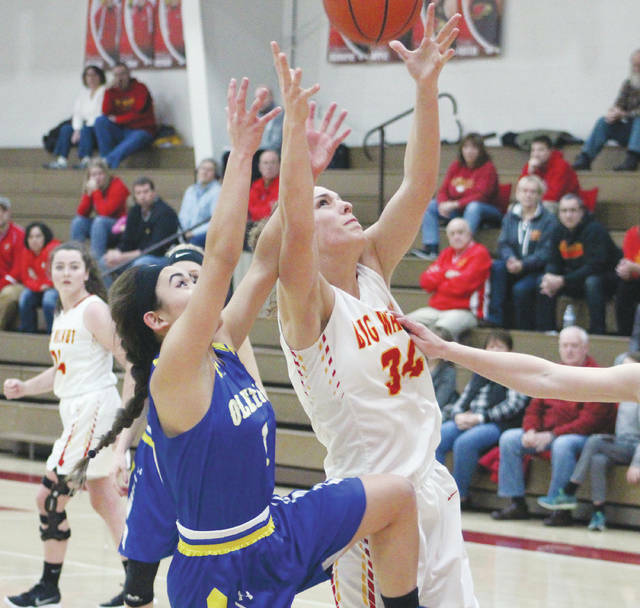 The Big Walnut girls basketball didn’t need a Makenna Hammond three-pointer in the final seconds to beat Olentangy this time. Senior Stacey Walters buried a three to start an 11-1 run in the first quarter to give the Golden Eagles the lead and control for good in a convincing 47-33 victory over rival Olentangy Tuesday night in Sunbury. Walters scored five points during the run and finished with nine points – all in the first half — to help BW snap a five-game losing streak to Olentangy. And that last win was decided by Hammond’s three-pointer to cap a 14-5 run in a one-point win Jan. 17, 2014. “It was exciting because it was the first time we had beat them in five (games),” Walters said. Walters followed her three with a long two and Emily Neff and Alexis Schone each followed with treys to push the lead to 13-5 in the first quarter. Maggie Goodman, Grace Pennington and Jessica Nation each scored baskets as Olentangy scored six of the next eight to get it as close as four. But, BW finished the half 11-4 to push the lead to 26-15 at the break. The Eagles pushed the lead as high as 13 early in the third before a pair of Meg Spohn free throws and a Molly Delaney basket pulled Olentangy as close as eight late in the third. Katie Cochran, Erin Boehm and Avery Schone each knocked down a pair of free throws down the stretch and Cochran added a pair of baskets late to push BW’s lead as high as 16 in the fourth. Boehm tied Walters with a team-high nine points and Neff and Cochran finished with seven apiece to lead BW (10-5). Olentangy is short-handed these days. Senior Lauren Biehl will miss the rest of the season with a broken finger suffered Jan. 15 at Olentangy Liberty. Freshman Courtney Suchan is out with a high ankle sprain sustained in last Friday’s game at Westerville South and junior Lauren Tarpey has been battling a knee injury. Nation scored a game-high 11 points and Pennington chipped in eight to lead Olentangy (7-9). “A lot of teams go through this and I guess we’ll have to ride it through the best we can,” Daniels said. Both teams return to league action Friday night at 7:30 p.m. Olentangy hosts Westerville North in OCC-Buckeye play while Big Walnut hosts New Albany in an OCC-Capital tilt.